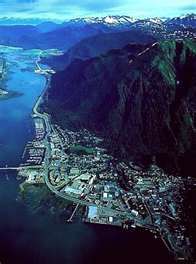 The Capital City, Juneau, is located on the Panhandle of Southeast Alaska. As the crow flys, it is about 600 miles southeast of Anchorage and about 900 miles north of Seattle. The current population of Juneau is 30,711. The economy is based on government, tourism, mining, and fishing.